When we work with students on their speech sounds, we are counting on the student and his family to practice at home to carryover the techniques. 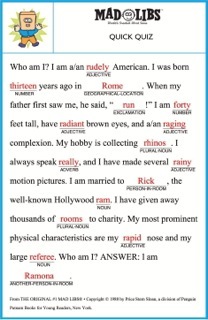 Mad Libs has created an iOS app that can help students carryover practice. I give my students a list of their target sound in words categorized by noun, verb, adjective, adverb, etc. We open the app, choose a Mad Lib such as “Sleepover Party,” “Camping Daze” or “Original Mad Libs” – there are so many to choose from – and then type in their words. When we are finished, we add their picture and email it to their mom or dad. Now they’ve got a story with their target sound to practice before our next session. Parents can download the app and use it at home, as well, for even more carryover practice. What do you use for carryover practice at home? We’d like to hear what you are using with your students or children!